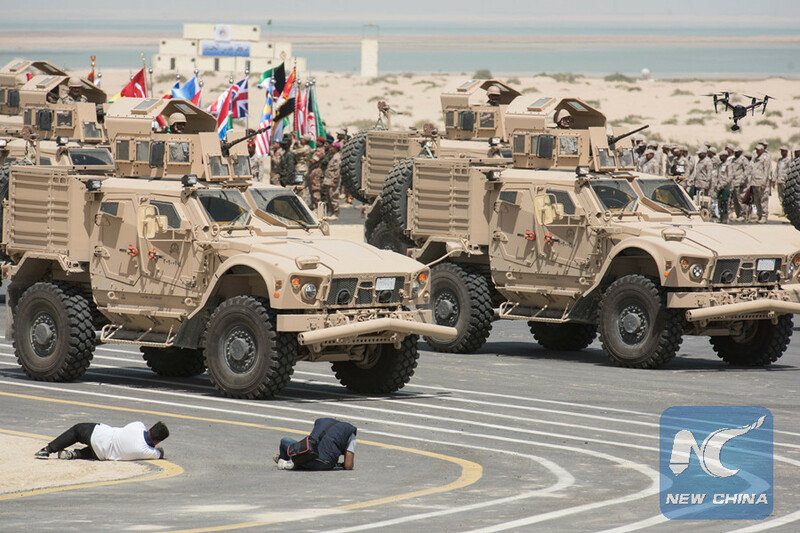 JUBAIL, Saudi Arabia, April 14 (Xinhua) -- Troops from 25 countries performed a live-ammunition drill in eastern Saudi Arabia on Saturday, one day before the 29th Arab League Summit. 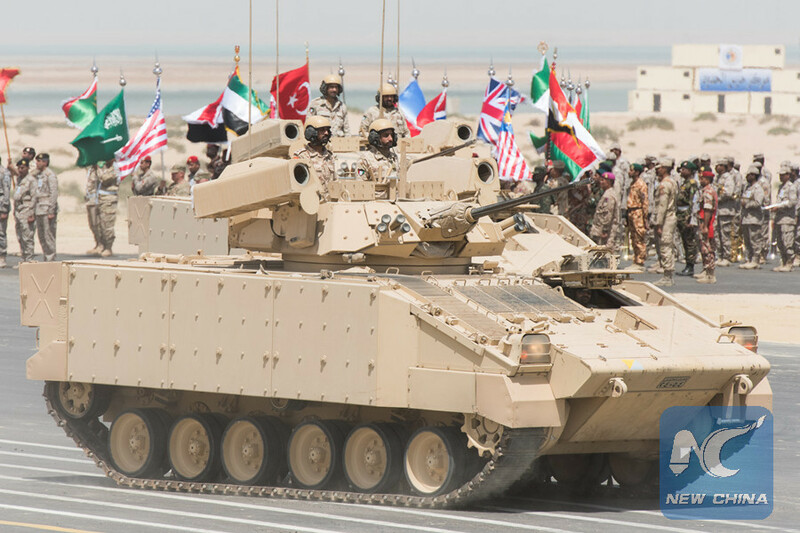 The drill was attended by Gulf states like Saudi Arabia, the United Arab Emirates (UAE) and Bahrain, as well as other countries including Egypt, Turkey, Pakistan, India, the United States and Britain. Soldiers with various weapons simulated sudden attacks, ground battles, airstrikes, amphibious assaults, and airborne assistance, after which a parade of gunships, tanks, armored vehicles, cannons, and vessels was staged. It is also a ceremony show for the "Gulf Shield Joint Exercise-1" from March 27 to April 7, the biggest such event in the Gulf region. 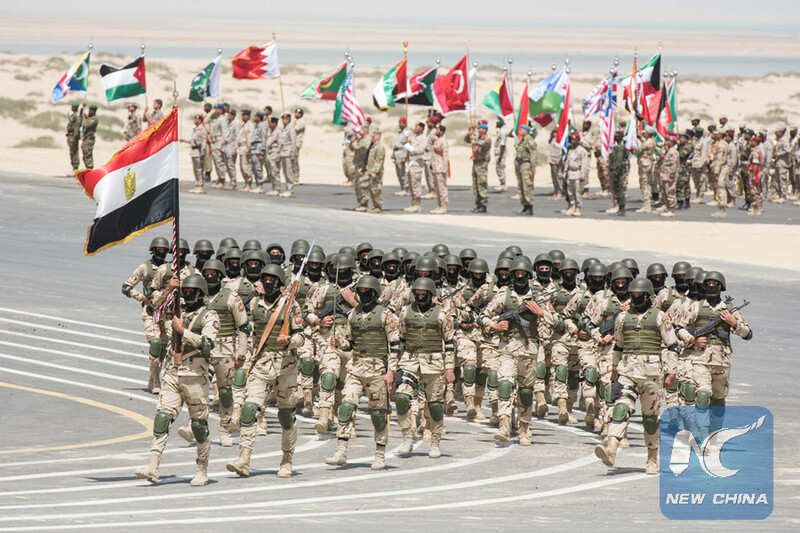 Abdullah Al Sobeiy, joint operation commander of the drill, said the joint exercise which concluded one week ago has displayed the power of the Gulf region "to fight enemies, and to confront threats and challenges on regional countries." Qatar also joined Saturday's drill, despite its ongoing rift with the Saudi-led quartet since last year. On June 5, 2017, Saudi Arabia, the UAE, Bahrain and Egypt severed diplomatic ties with Qatar over allegations of Doha's support for terrorism and interference in their internal affairs, which Qatar has all denied. 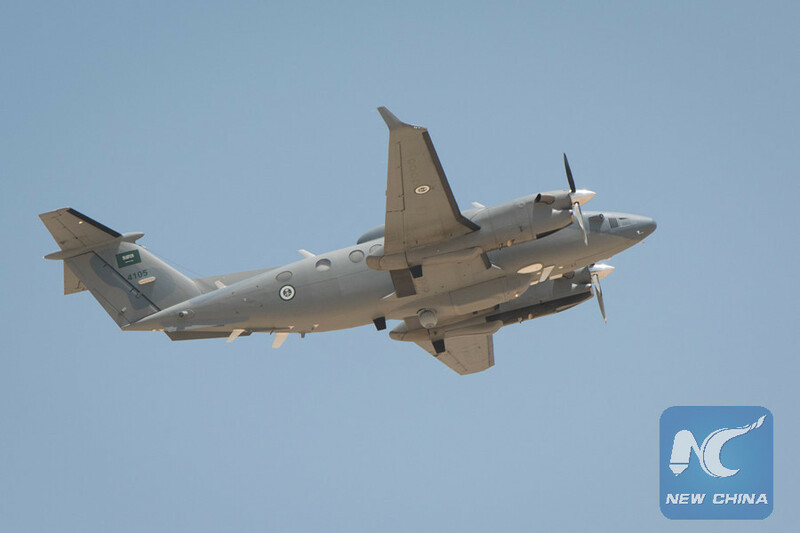 Also on Saturday, Saudi Arabia's Foreign Ministry expressed the kingdom's support for the airstrikes launched by the U.S., Britain and France on Syria earlier in the day, the Saudi Press Agency reported. Therefore, the issue of Syria is expected to lengthen the list of crucial topics during the Arab League Summit to be held in the eastern Saudi city of Dhahran on Sunday.